New Year’s resolutions often seem most attainable in the rose-colored imaginary future that will begin just after the confetti has come down: It’s a new year, it will be a new you. But according to a survey conducted by the British psychologist Richard Wiseman 88% of all resolutions end in failure. We’ve all been there, I’m going to join a gym and get fit this year. The first few days, even weeks, may go well. But after the initial enthusiasm wears off you no longer want to get out of bed an hour early to make it to the gym. Five days a week seems too much. So does four. Then three. By May you’re not going at all. Your original optimistic goal seems not only unattainable but a stinging rebuke. But why do the majority of resolutions end so ignobly? As authors of the upcoming book, “The Art of Doing: How Superachievers Do What They Do and How They Do It So Well,” we spoke with dozens of extraordinary people including celebrities, businessman, elite athletes and iconoclastic achievers about the secrets of their success. Although the challenging goals they set for themselves were like New Year’s resolutions on steroids, these people all shared a critical attribute—self-awareness. Instead of choosing one path and stubbornly sticking to it, they relentlessly questioned themselves about how best to achieve their goals. Willpower, of course, was important, but willpower alone was not enough. These high achievers learned how to deal with setbacks, how to adapt to changing conditions and when something did not work, they developed entirely new strategies. What we learned from their success stories was that if you only apply the brute force of a stubborn mule to pursue a goal, you are likely, make that very likely, to fail. If you don’t develop the cognitive tools to overcome mental blocks, frustration and loss of enthusiasm, sooner or later you will end up with another broken promise to yourself. In other words, the unexamined resolution is not worth making. Pick Well. Take some time to think about what you’re really passionate about or what you most want to improve about your life in the coming year. 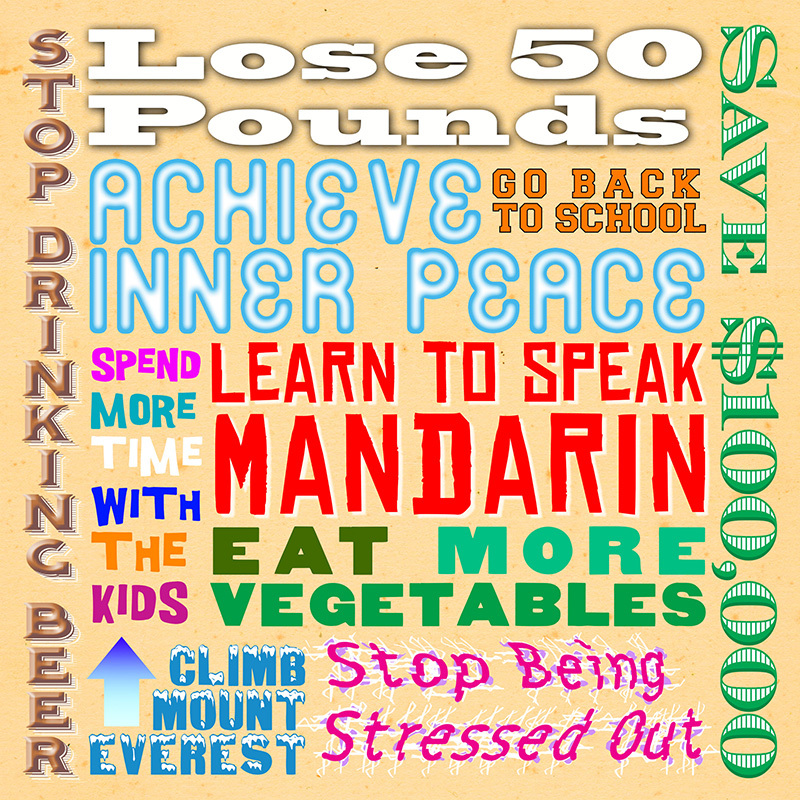 Studies show you are much less likely to abandon a resolution that will really change your life for the better. Make a plan. Once you have decided on a goal, think imaginatively about how to achieve it. If your resolution is to spend more time with your family, why not involve everyone? Come up with shared interests and actually schedule times for those activities. Also have a plan for how you to deal with inevitable setbacks and self-criticism that will crop up along the way. Know what motivates you and use it. There is no universal rule for how to achieve a goal so figure out what will work best for you and tailor your resolution (and your approach to it) accordingly. If you’re a big picture person you may have a better chance of keeping a more sweeping resolution such as I’m going to have more adventure in my life. If you are a process-oriented person choose a resolution with measurable benchmarks such as I want to be more fit so I’ll lose a pound a week. If you respond well to incentives, set incremental goals that when reached will trigger a reward for you such as For each $1000 dollars of debt I repay, I’m going to do something special for myself. If you have trouble with follow through use Post-it note reminders, keep a journal or use an app to help remind you of your goal. Pay Attention: Assess and reassess your progress. Tweak the way you talk to yourself about your resolution. If you lose enthusiasm, spend some time trying to figure out why and what may get you back on the right track. And don’t be afraid to confide in your friends and family—they might have ideas you haven’t thought of. Make it fun. No one likes to be hectored to do things even if it is you hectoring yourself. Using an angry internal voice is the best way to insure that you will end up resenting your resolution. Your relationship to a resolution should be more like creative play than ditch digging. As you build on this self-knowledge and learn which tactics work best to help you accomplish your resolutions, new strategies and methods will become apparent. Learning to ace a New Year’s resolution is just the beginning. You can apply that same knowledge to achieving even larger life goals. 2,000 B.C. : Ancient Babylonians celebrate the New Year by returning something borrowed from a neighbor the previous year. 153 B.C. Roman god Janus with two faces—one that looks back on the past and the other that looks forward to the future—is placed at the head of the calendar. Many Romans make promises at the beginning of the New Year in the hopes that Janus will forgive their transgressions. 1722: American theologian Jonathan Edwards turns New Year’s resolutions into an art form. Penning 70 resolutions over a two year period including, “Resolved, never to speak evil of any, except I have some particular good call for it,” he commits himself to review them every week. Our book is available for pre-order here.